In the middle of 2017, Corsair released the Carbide Spec-04 case, it is a low cost mid-tower geared at the budget builders while still providing a solid foundation for the latest hardware. Initially it had a retail price of $49.99, it featured an angular design to the front of the case giving it a modern look. Since its release, Tempered Glass panels have become extremely popular, and users have been looking for budget friendly cases that feature Tempered Glass side panels. Corsair heard this and decided to do a small update to the Spec-04. 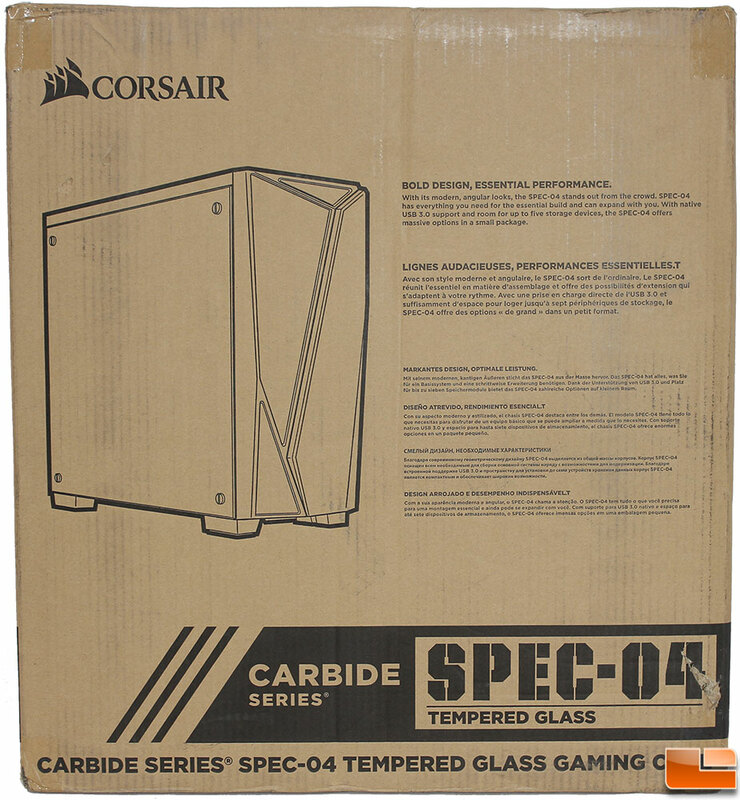 Corsair has recently released the Spec-04 Tempered Glass edition, which is identical to the original Spec-04 with the exception of the Tempered Glass side panel. 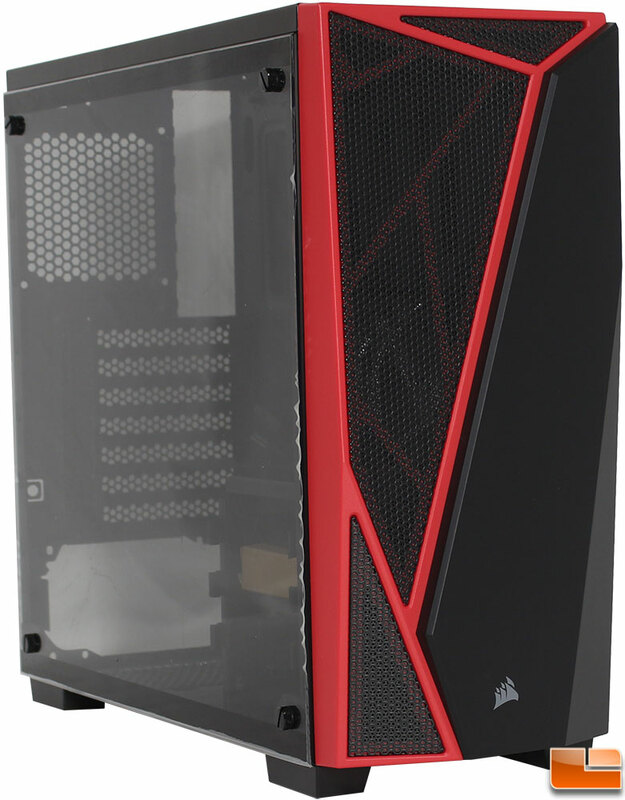 The original Spec-04 case was available in three color schemes, however for the Tempered Glass edition, Corsair has only released one version with the Black/Red color scheme. If you were to set the two cases side by side, the only difference you will find is the side panel, and the price. Adding the Tempered Glass side panel, does cause a small increase in the price, the Spec-04 Tempered Glass has a retail price of $59.99 shipped. Years ago, pretty much every case came in a brightly colored box. Now almost all of them come in standard printed cardboard boxes. This helps to keep the cost down, while still giving you a good idea of the contents. 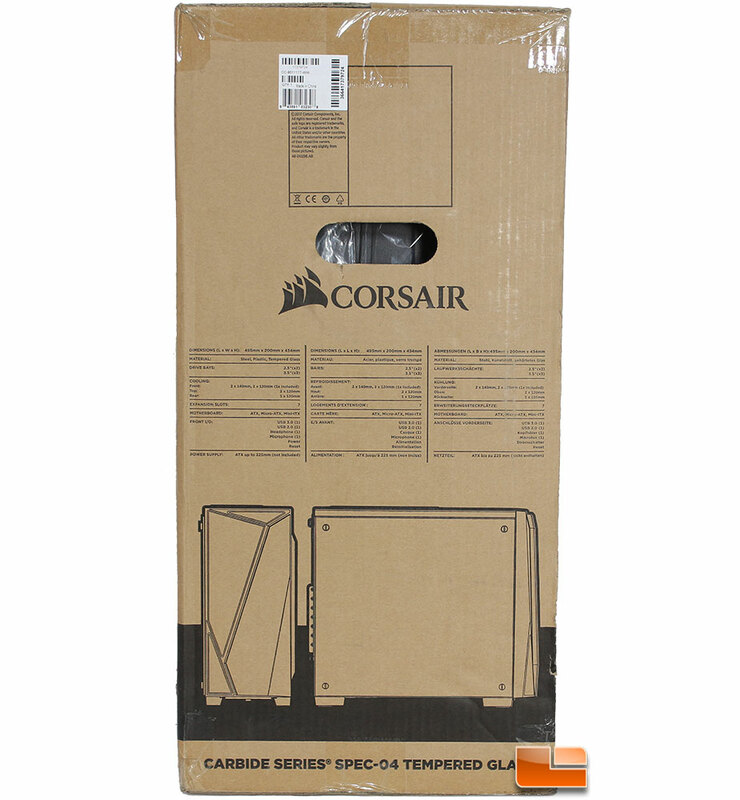 Corsair has a standard layout for their packaging, where on the front of the box you get an overview of the case, along with some detailed information. Turning to the back of the box you find an exploded view of the case, with specific components called out. Finally the sides of the box present the specifications in multiple languages. 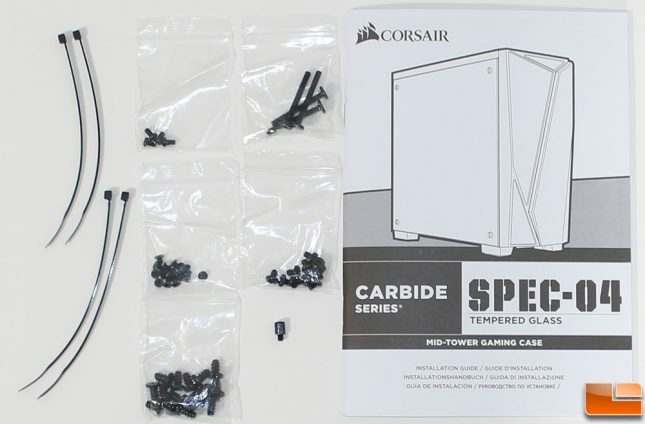 Corsair includes all the necessary accessories to build a system in the Spec-04, and some extra’s that are not required for the standard build. In the accessory pack, is four cable ties, four pan-head SSD screws, sixteen short fan screws, ten motherboard screws, four long fan screws, sixteen flat SSD screws and one additional motherboard standoff. Corsair also includes a detailed multi-language user guide to help users build their system successfully. 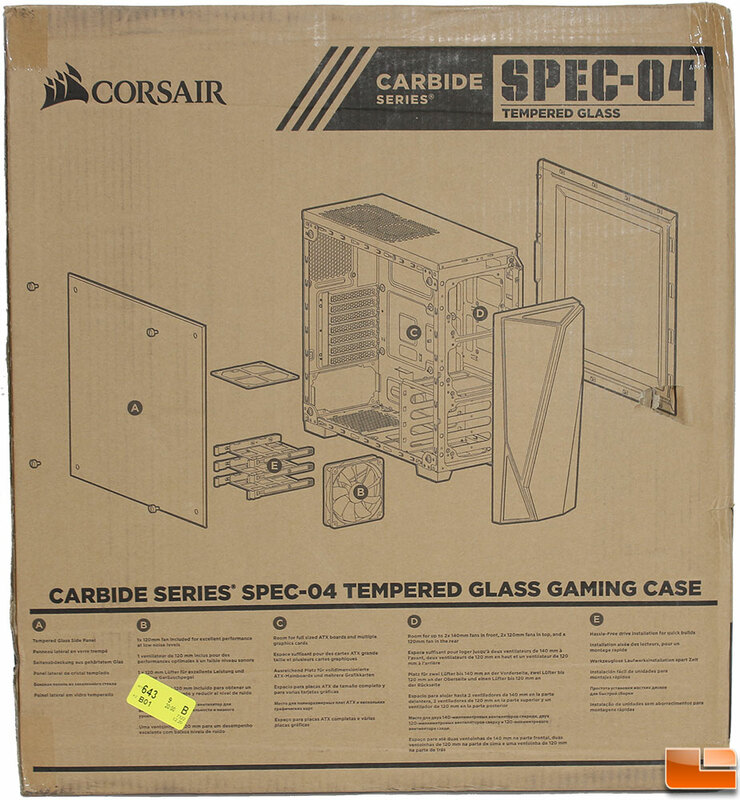 Let’s take a closer look at the Corsair Spec-04 Tempered Glass edition before opening it up to build a system.